Idea cellular, the country’s Fourth largest mobile phone company by subscribers, and they launched a new offer for all this subscriber and this offer was launched in last week of june but many of you don’t know about this offer that’s why I am posting this offer information. 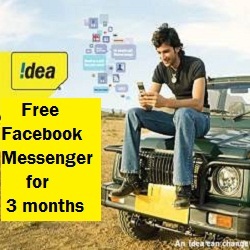 Idea launches the Free FACEBOOK Messenger for its subscribers for first three months. Free Facebook Messenger will be available only for the Android and IOS device users. You can Activate this offer or service by Dailing *800*88# from any android or IOS device to send messages, share pictures, locations and start group conversations with friends while on the move. This new offer is for all Idea 2G and 3G prepaid subscribers for a period of 3 months from the date of activation. Note:- The offer on Idea network will be available for activation until 31st july 2013. So what are you waiting for ,, activate now,,and enjoy free facebook messenger for 3 months. If this article helps you or if this article tends to be useful for you then you can join us on social site and feel free to share this on Social sites.